McCoy was the starting quarterback for the Texas Longhorns from 2006–2009 and won the 2008 Walter Camp Award, was the 2008 Heisman Trophy runner-up and was a 2009 Heisman finalist. McCoy is second to Boise State's Kellen Moore in games won by a NCAA Division I quarterback. In his senior year, he won 13 of the top 15 major college player awards including quarterback of the year, offensive player of the year and outstanding football player of the year. After sitting out the 2005 Longhorn season as a redshirt, McCoy was the starting quarterback for the 2006 Longhorn team. On November 4, 2006, McCoy threw his 27th touchdown pass in a win against Oklahoma State, to take sole possession of the Texas school record for most touchdowns ever thrown by a quarterback in a single season. Subsequently, in the 2006 Alamo Bowl on December 30, McCoy threw two touchdowns against Iowa Hawkeyes football to tie Nevada's David Neill for second place for freshman touchdowns in a single season. Also during the 2006 season, McCoy was named College Football News Big 12 Player of the Year and was named the quarterback to their "All Freshman Team". Injuries caused him to miss portions of the final regular season games, but he was able to play for the entire duration of the Longhorns' bowl game. Leading the 2007 Longhorns, McCoy was somewhat less consistent. Through the first five games he threw nine interceptions—two more than he threw in the entire 2006 season. He went on to throw 18 interceptions during the 2007 season. Leading the 2008 Texas Longhorn football team, McCoy and the Longhorns began the season with eight straight wins, including a win over then #1 Oklahoma, #6 Oklahoma State and #11 Missouri. His performance helped the Longhorns rise at one point to the #1 ranking in the national polls, although UT lost to Texas Tech University and finished ranked third in the BCS standings. In 2008 McCoy set school records for most career touchdown passes, most touchdown passes in a season, most total touchdowns by a Texas player, most career wins, and most career passing yards. In addition to setting passing records, McCoy led the team with 561 yards rushing and eleven rushing touchdowns, establishing a reputation as a dual threat quarterback. McCoy was named the 2008 AP Big 12 Offensive Player of the Year. McCoy attended the University of Texas at Austin, where he played for coach Mack Brown's Texas Longhorns football team from 2005 to 2009. Colt was a four-year starter from 2006-2009. He won or shared the team's MVP all four years, the only player in school history to do so. As a freshman, he was given a redshirt year so he did not play during the team's 2005 national championship season. He served as the quarterback for the scout team in practice against the starting defense. During this time, Matt McCoy (no relation) was officially listed as the number three quarterback behind Vince Young and Matt Nordgren. When Brown chose to play Matt McCoy in four separate game situations where Texas had a commanding lead, confusion arose as to which McCoy was in the game. Many sportscasters mistakenly referred to Matt McCoy as Colt McCoy, as Colt was the more widely known player. 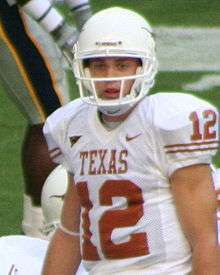 The following year, with Young forgoing his senior year to enter the NFL and Nordgren graduating, the position of starting quarterback for the defending National Champion Texas Longhorns came down to a competition between red-shirt freshman Colt McCoy and true freshman newcomer Jevan Snead. After winning out a close competition with Jevan Snead, McCoy became the 2006 starting quarterback for the University of Texas. The season opener saw McCoy lead the Longhorns to a 56–7 victory over North Texas, throwing for three touchdowns and rushing a yard for another, while throwing no interceptions. He was 12-19 in passing, and ran for 27 yards to help set up a touchdown. In only his second pass as a college quarterback McCoy threw a 60-yard touchdown pass. He was the first Texas freshman quarterback to start and win a season-opening game since Bobby Layne in 1944. The next week, the Longhorns faced #1 Ohio State at home. McCoy went 19-32, 156 yards, one TD, and one INT while rushing four times for a total of eight yards. Ohio State defeated the Longhorns 24–7, ending the Longhorns 21-game winning streak. On October 14, 2006 McCoy threw a Texas record six touchdown passes in the win against Baylor. The previous record of five touchdown passes had been held by James Brown (set vs. Baylor in 1994) and Chris Simms (vs. Oklahoma State in 2001). On October 25, 2006, he was 9th in the nation with a quarterback rating of 165.4. In the 2006 Oklahoma State game McCoy threw for his 27th passing touchdown of the season, giving him sole possession of the single-season Texas record and putting him two TD's shy of the NCAA single season record for freshman quarterbacks (29). Coincidentally, this 27th pass was also for 27 yards. During the November 11, 2006, game against Kansas State, McCoy suffered a stinger shoulder injury while rushing for a touchdown on the opening drive against Kansas State. Snead came in and played the remainder of the game. The Longhorns fell behind by as much as 21 points before Snead brought them back to within 3, finally falling in an upset by the Wildcats 45–42. There was speculation that Snead might be the starter for the final regular season game, because it was unknown whether McCoy would return for the Longhorns season closer against rival Texas A&M on November 24, 2006. However, McCoy was cleared to play the game against the Aggies. On December 1, 2006, the Longhorns issued a statement confirming that back-up quarterback Jevan Snead had left the team and would transfer to an unspecified school. This meant there would be no scholarship quarterback available to play in the Longhorns' bowl game if McCoy was not ready. On December 21, 2006, Texas announced that McCoy was cleared to start in the Alamo Bowl. In the 2006 Alamo Bowl played on December 30, McCoy threw two touchdowns against Iowa to tie the NCAA freshman record of 29 touchdown passes established by Nevada's David Neill in 1998. This record has since been broken by Oklahoma's Sam Bradford in the 2007 season. After just one season with Texas, McCoy received a lot of media attention, including appearing on some lists of the nation's top players of 2007. In June 2007, McCoy appeared on the cover of Dave Campbell's Texas Football alongside Texas A&M quarterback Stephen McGee and TCU defensive end Tommy Blake. Additionally, Rivals.com named McCoy one of the top-10 quarterbacks going into the 2007 season. He also made the Athlon Sports first-team All Big 12. On June 26, 2007, Maxwell Football Club president Ron Jaworski announced that McCoy had been named to the preseason watch list for the Maxwell Award. The initial list includes 64 players. The winner turned out to be Tim Tebow. In their 2007 season preview magazine, CBS Sportsline.com listed McCoy as one of twelve players on the “Heisman Watch”; saying “We were touting him for the Heisman midway through his freshman season until he was injured against Kansas State. Older and stronger, McCoy has an awesome receiving corps to make a run at the hardware for real.” He is also one of the 35 quarterbacks placed on the 2007 Manning Award watch list. Further, the Davey O'Brien National Quarterback Award Watch List added McCoy on August 21, 2007. McCoy played the worst game of his career in an upset loss to the Kansas State Wildcats; He threw for 200 yards and had four interceptions. He also suffered a concussion during the game and left the field just prior to the end of the first half and again prior to the end of the game. After that game, Sports Illustrated selected him as one of the season's 10 "Most Disappointing College Players" and noted that he his nine interceptions thrown so far in 2007 were already two more than he threw in the entire 2006 season. Stewart Mandel of Sports Illustrated listed several factors contributing to the Longhorns' struggles. He cited the off-field problems as evidence that no Texas player has been able to show the superior leadership skills of Vince Young. Mandel said that McCoy, still only a sophomore, had not been able to completely fill that gap and that McCoy's play had not been as good as during 2006. He also said part of the blame is to be placed on an offensive line that lost several starters and has not been able to consistently protect McCoy. Finally, he noted that the running game had been "equally inconsistent." It was the worst home-field loss in Mack Brown's time with Texas. For the Wildcats, the win over Texas was the first road victory over a top–ten team in school history. The Longhorns were in control of the Iowa State game almost from the very beginning and they routed the Cyclones 56–3, the worst loss for the Cyclones since 1997. Lined up in the spread offense on the first play from scrimmage, Colt McCoy scrambled away from a blitz and threw a pass to Jordan Shipley for a 58-yard touchdown. The offensive line provided great protection for Colt McCoy, who called most of the plays without huddling and directed the Longhorns to touchdowns on his first five series. He completed 23 of 30 passes for 298 yards, 4 touchdowns, and no interceptions. His most athletic play came early in the third quarter when he evaded three defenders on a play from the Cyclones' 20-yardline. He twisted around and managed to stay upright long enough to throw a pass to Nate Jones in the end zone. He capped off his performance by making his first rushing touchdown of the season, a career-long, 44-yard run in the third quarter. The play was designed to be a screen pass to the fullback. Mack Brown said, "Colt was as good today as I've ever seen him." Brown also praised McCoy for taking on more of a leadership role with the team. The Austin American-Statesman said, "Colt McCoy is shedding his sophomore slump. In the past two games, he is 42 of 56 passing for 622 yards with six passing touchdowns, one rushing touchdown and just one interception. That translates to a quarterback rating of 200.1." However, against Baylor on October 20, Colt would go on to throw 2 interceptions and 1 touchdown, and against Nebraska the following week, McCoy completed less than 50% of his passes and threw another interception. On the day after Thanksgiving, McCoy was 17 of 32 with 1 interception, while be sacked 4 times in the 38-30 loss to Texas A&M. At the conclusion of the 2007 regular season, Mccoy had thrown for 21 touchdowns and 18 interceptions. In the 2007 Holiday Bowl, McCoy led the Longhorns to a 52–34 victory and won the offensive-player MVP award. On January 2, 2008, UT running back Jamaal Charles decided to forgo his senior season with Texas in favor of joining the NFL as a professional football player in the 2008 NFL Draft. With Charles' departure, McCoy became the leading returning rusher for the 2008 Longhorns. McCoy rose in the record books during the first four games of the season. On August 30, 2008, McCoy passed for 222 yards and rushed for 103 yards against FAU, becoming the 2nd player in UT history to pass for 200 and rush for 100 yards in more than one game; the other being Vince Young. On September 20 Colt McCoy surpassed the Texas All-Time record for the most passing TD's with 62 while beating Rice 52–10. The record was previously held by Major Applewhite. Through the first four games of 2008, McCoy completed 80% of his passes and had a quarterback rating of 209.71. On October 18, against Missouri, McCoy completed the game with 337 yards on 29-of-32 passing with two touchdowns, rushed for two more and at one point completed a school-record 17 passes in a row. His completion ratio of 79% coming into the game improved as he completed 91% of his passes in this game. His four touchdowns put him alone in first place for the most career touchdowns scored at Texas (82), passing Vince Young (81). UT lost to Texas Tech with one second remaining in the game. McCoy gave a good performance but came up short as his Red Raider counterpart, Graham Harrell had an outstanding day. Following that loss, UT fell to #4 in the BCS rankings. They climbed to #3 the following week as the Horns beat Baylor and former #3 Penn State lost. The win over Baylor was the 829th win for the UT football program, which tied Notre Dame for 2nd in the list of college football's ten most victorious programs. The win was the 31st for Colt McCoy, setting a new school record. McCoy rushed for two touchdowns and threw for 2 more. He completed 23 of 28 attempted passes (82%) for a total of 311 yards. That yardage put him at 3,594 yards for the season—another school record. His longest pass of the evening, 68 yarder on a post route to Jordan Shipley late in the third quarter, ended up a yard short of being McCoy’s fifth touchdown of the evening. On January 5, 2009, McCoy led the Longhorns to 24–21 victory over Ohio State in the Fiesta Bowl. McCoy completed 41-of-59 passes for 414 yards, two touchdowns and one interception. He was named the Offensive Player of the Game for his performance. In his final season, McCoy led the Texas Longhorns to a perfect 12–0 regular season record, as well as a 13-12 victory over the Nebraska Cornhuskers to win the Big 12 Championship in Cowboys Stadium. While becoming the most victorious quarterback in NCAA history with 45 career wins, McCoy was again the focal point of the Longhorn offense that scored 550 points in 2009, ranked third in UT All-Time season scoring (behind only the 2005, and 2008 teams). McCoy led a fast paced offense, with accurate, short passes in his repertoire. The Texas offense executed a total of 1,053 plays in 14 games played in 2009. His favorite target was WR Jordan Shipley (#8), who went on to play in the NFL with the Cincinnati Bengals. McCoy left the 2010 BCS National Championship Game against Alabama during Texas' first offensive drive early in the first quarter with a right shoulder injury and was sidelined for the remainder of the game. McCoy was replaced by true freshman quarterback Garrett Gilbert. Alabama would go on to win the game 37–21. In the seventh game of 2008, he completed 91%. He finished the 2008 regular season with a 76.7% completion percentage, breaking the mark set by Daunte Culpepper for Central Florida, and was the Longhorns' leading rusher with 576 yards and 11 rushing touchdowns. His record as a starter was 45-8. UT - Consecutive Passing Completions, Game (18) (October 25, 2008 versus Oklahoma State (surpassed his own record of 17 on October 18, 2008 versus Missouri). NCAA, Big 12 & UT - Highest Single Season completion percentage: 76.7%. NCAA, Big 12 & UT - Colt McCoy is one of the three FBS quarterbacks to average 10 wins per season for four seasons. On November 11 (with UT holding an 8-1 record) Heisman voter Rodney Gilmore of ESPN.com had McCoy listed third of five Heisman candidates. Gilmore said, "I love his numbers (78 percent completion percentage, 28 TDs, only 7 interceptions and 2,879 yards) and his gutsy second-half performance against Texas Tech. And I have not forgotten about his epic performance against Oklahoma just a few weeks ago. However, Harrell outplayed McCoy head-to-head in the showdown last week, so Harrell has a leg up on him for now, but McCoy is within striking distance." That same day, the Rocky Mountain News poll listed Harrell first and McCoy second in their weekly poll of 10 Heisman voters. Harrell received 44 points and 7 first-place votes while McCoy had 34 points and 2 first-place votes. After Oklahoma beat Texas Tech, Oklahoma quarterback Sam Bradford barely took the lead in the Rocky Mountain News poll of 10 Heisman Trophy voters. The Austin American-Statesman reported, "Bradford leads Texas’ Colt McCoy by just one point. In terms of first-place votes, Bradford received five, while McCoy received three. The others went to Texas Tech’s Graham Harrell, who had led the poll since Tech’s win over Texas, and Florida’s Tim Tebow, last year’s Heisman winner." On November 25, 2008 Colt McCoy was named one of three finalists for the Maxwell Award, which is presented to the top all-around player in the country. The other finalists were Florida quarterback Tim Tebow, the prior year's winner, and Texas Tech quarterback Graham Harrell. Oklahoma's Sam Bradford was not selected as a finalist. McCoy also was named a finalist for the Davey O'Brien Award, which goes to the country's top quarterback. Bradford and Harrell were the other two candidates; Tebow did not make the list for this award. After McCoy led the Longhorns to a victory over rival, unranked Texas A&M (a team he had lost to twice in the past), Sports Illustrated analyst Stewart Mandel said the quarterback took a big step towards claiming the Heisman Trophy. Mandel wrote, "From the Longhorns' opening touchdown drive, in which he accounted for 67 of Texas' 80 yards, McCoy was very much the one-man wrecking crew he's been all season long...His final numbers in just over three quarters of work Thursday night: 23-of-28 passing for 311 yards and two touchdowns and 11 rushes for 49 yards, with touchdown runs of 16 and 14 yards. For the season, McCoy now has a 77.6 completion percentage (soon to be a new NCAA record) for 3,445 yards, 32 touchdowns and seven interceptions, plus 476 yards and 13 TDs running" Comparing McCoy to fellow Big 12 South quarterbacks Sam Bradford and Graham Harrell, Mandel said, "But here's where McCoy stands out to me. Bradford, as talented as he is, is helped by the fact he has a trio of explosive receivers and two potential 1,000-yard rushers behind him. Harrell has Michael Crabtree. Daniel has Jeremy Maclin. With all due respect to Jordan Shipley and Quan Cosby, McCoy is Texas' offense. Much like Tim Tebow last season, he's both his team's leading passer and rusher. Also like Tebow—you have to wonder sometimes how he's still standing. McCoy was sacked three times Thursday night and endured several brutal hits. Following his third-quarter touchdown run, trainers attended to his shoulder on the sideline. But he was right back in there the next series." Bradford and Harrell each had one regular-season game left, against Oklahoma State and Baylor, respectively. Tebow had games remaining against Florida State and Alabama. In 2009, McCoy was again in strong consideration for the Heisman, even with the two previous Heisman winners coming back for their senior seasons. At the start of the season he and Tebow were considered the favorites. But McCoy's numbers were down a little from 2008, and despite leading his team to the BCS Championship game, his chances of winning disappeared during a close 13-12 Big 12 Title game in which he threw 3 interceptions, no touchdowns and nearly threw the game away at the end. Despite this, he still had an outstanding season and was again named a finalist, this time along with Tim Tebow, Mark Ingram, Jr, Toby Gerhart and Ndamukong Suh. He became only the 2nd Longhorn, along with Ricky Williams, to be a two-time Heisman finalist. He finished third behind Ingram and Gerhart. In October 2008 McCoy said he would stay at Texas for his senior year instead of leaving for the 2009 NFL Draft. McCoy was quoted as saying, "I'm going to play here for four years. I've been blessed to be able to play here. Not very many people get to [start] here for four years, so what an opportunity. And if the NFL is there for me, then I hope that I'll get to keep playing, because I love to play this game. Hopefully, it will work out." McCoy was drafted in the third round as the 85th overall pick by the Cleveland Browns in the 2010 NFL Draft. One reporter commented that McCoy was drafted later than expected because "he lacks NFL size..., has small hands and was injured in the last game of his career at Texas." In response to being chosen by Cleveland, McCoy said, "I can't wait to be a Cleveland Brown and that we're going to win a lot of games. Cleveland has a little orange in their jerseys just like UT. It's a perfect fit." On July 23, McCoy agreed to terms on a four-year, $5 million contract. Pointing out that Cleveland already had three quarterbacks, Browns president Mike Holmgren said McCoy would likely not play his first season with the team in order to develop him as an NFL quarterback. However, because injuries to starting quarterback Jake Delhomme and back-up Seneca Wallace, McCoy made his first career start against the Pittsburgh Steelers in week 6. McCoy completed 23 of 33 passes for 281 yards, a touchdown, and two interceptions in the Browns' loss. He also scrambled four times for 22 yards. McCoy started the following week against the New Orleans Saints and contributed to the surprising victory over the defending Super Bowl champions 30-17 in New Orleans. On November 7, McCoy made his third consecutive start and led the Browns to another upset victory, this time against the New England Patriots 34-14. He then started again on November 14 against the New York Jets; however the Browns lost in overtime with McCoy throwing for 205 yards and a touchdown. McCoy injured his ankle in week 11 against the Jacksonville Jaguars and missed the next three weeks before returning to start under center against the Cincinnati Bengals in week 15. McCoy threw for 243 yards and 2 touchdowns with no interceptions, but Cleveland lost. In each of the final two games against division rivals Baltimore and Pittsburgh, McCoy threw 3 interceptions as the Browns lost both games. McCoy finished the season with 6 touchdowns against 9 interceptions. After a long-awaited pre-season after the agreements from the NFL lockout, and the release of Delhomme, McCoy became the starter for the Browns. In the home opener against the Bengals, McCoy threw 19 for 40 attempts throwing 213 yards with two touchdowns and one interception in a 27-17 loss. The next two weeks, the Browns defeated the Indianapolis Colts and the Miami Dolphins with McCoy throwing combined 41 of 71 attempts, 421 yards, and 3 touchdowns with 1 interception. Against the Tennessee Titans in week 5, Colt threw 1 touchdown and 1 interception in a 13-31 loss. After a bye week, McCoy and the Browns lost to the Oakland Raiders 17-24, McCoy threw for 215 yards with 2 touchdowns and no interceptions. After the loss to the Oakland Raiders the Browns played the Seattle Seahawks and won 6-3 as McCoy finished with 178 yards, no touchdowns, and 1 interception. Against the Pittsburgh Steelers in Week 14, McCoy threw 2 interceptions and no touchdowns in a 3-14 loss where McCoy would also sustain a concussion. His father raised eyebrows when he questioned whether or not McCoy's team had properly evaluated him for the concussion prior to returning to the game. McCoy stated that he did not remember anything. James Harrison, the Steelers player responsible for the helmet-to-helmet hit on McCoy, was subsequently punished by being suspended for the Steelers' next game against the San Francisco 49ers. McCoy spent the 2012 season backing up Browns' rookie first round pick Brandon Weeden. When Weeden was injured against the Denver Broncos, McCoy completed 9 out of his 17 pass attempts for 79 yards. On April 1, 2013 the Browns traded McCoy and a 2013 6th round pick to the San Francisco 49ers in exchange for San Francisco's 2013 7th and 5th round picks. McCoy signed with the Washington Redskins on April 3, 2014. On October 19, 2014 against the Tennessee Titans, McCoy replaced Kirk Cousins after halftime, with Washington trailing 10-6 and Cousins having caused two turnovers. On his first pass, McCoy completed a 70-yd touchdown pass to Pierre Garçon. McCoy then went on to lead the Redskins on a game-winning drive, winning the game 19-17. On October 27, 2014, McCoy was named the starter over Cousins, and had his first start on the team against the Dallas Cowboys. In his first start since 2011, McCoy completed 25 of 30 passes for 300 yards with a rushing touchdown and an interception, earning an overtime victory against the Cowboys, his favorite team growing up. The team benched him for injured starting quarterback Robert Griffin III after McCoy's two victories. The team lost the next 3 games without McCoy. On November 25, it was reported that McCoy would replace the benched Griffin in the November 30 game against the Indianapolis Colts. McCoy was placed on injured reserve on December 16 due to a neck injury he suffered in a shutout loss to the St. Louis Rams. McCoy re-signed with the Redskins on March 17, 2015. He spent the regular season as Kirk Cousins' backup, getting into two games and going 7-for-11 for 128 yards and one touchdown for the season. McCoy signed a three-year contract extension with the Redskins on March 9, 2016. McCoy enjoys hunting, fishing, and playing golf. On May 29, 2006, he swam 300 yards across a lake to help save the life of Ken Herrington who was having a seizure on a small dock that extended into the privately owned lake. While in Austin, Texas, Colt was active in the UT community service program including visits to the Austin's Children's Hospital and volunteering at the Children's Miracle Network telethon. McCoy also took a trip to Peru to take care of some missionary work and also visited hospital patients. Colt McCoy was the roommate of his favorite receiving target at Texas, Jordan Shipley. McCoy's father was the roommate of Shipley's father at Abilene Christian University. Colt's younger brother Case and Jordan's younger brother Jaxon were also roommates at the University of Texas and played the same positions as Colt and Jordan. McCoy has already extended a generous hearty healthy message to the children of Central Texas by joining the ambassadors of Scott & White Hospital Pediatric Division as they transitioned into new facilities in Temple, Texas in 2010 and Killeen, Texas in 2011. McCoy is a member of the Church of Christ, and attended Westover Hills Church of Christ in Austin, Texas. When living in Buffalo Gap, Colt attended and was very involved with the Oldham Lane Church of Christ. McCoy has participated in a church youth group since 2002. His work has included landscaping yards for the elderly, visiting nursing homes, helping with meals on wheels and ministry. Fellow quarterback Tim Tebow said of McCoy, "I was really proud of him because I think he represents college football and his faith extremely well, too, which I really respect as well. I think he's done a good job with everything he's going through." His grandfather, Burl McCoy, is a member of the Abilene Christian University (ACU) Sports Hall of Fame for his exploits both as an athlete and as the former women's basketball coach. Colt McCoy's younger brother Chance McCoy was a wide receiver at ACU. His youngest brother Case McCoy quarterbacked at the University of Texas and now resides and works in the Austin area. Some media features on Colt McCoy refer to him jokingly as "The Real McCoy" because of his performance on the field as well as his leadership and personality. McCoy was selected to welcome President George W. Bush home to Texas after his second term ended on January 20, 2009. On January 12, 2010, Colt became engaged to his girlfriend, Rachel Glandorf, former middle-distance Track and Field athlete for Baylor University, by proposing on the screen at DKR-Memorial Stadium in Austin. Their marriage took place on July 17, 2010. ↑ Livingston, Bill (April 30, 2012). "McCoy's shortcomings exacerbated by lackluster Browns". Cleveland.com. Retrieved August 18, 2014. ↑ "2010 NFL Draft QB ranking". CBS Sports. Retrieved February 8, 2010. 1 2 3 "Tebow looks to become second two-time Heisman winner". ESPN.com. The Walt Disney Company. December 10, 2008. Retrieved December 10, 2008. ↑ Dodd, Dennis With Young leaving, Longhorns to unholster Colt CBS. Retrieved February 28, 2006. ↑ "Texas' new No. 1 - McCoy tops QB depth chart heading into spring drills". SportsIllustrated.com. Associated Press. February 23, 2006. Retrieved February 22, 2006. ↑ "Oklahoma State 10 - (4) Texas 36 - McCoy launches Horns past Cowboys in surprisingly lopsided game". ESPN.com. The Walt Disney Company. November 4, 2006. Retrieved January 7, 2008. ↑ "OU QB Bradford sets NCAA freshman scoring record". ESPN.com. The Walt Disney Company. November 24, 2007. Retrieved October 18, 2008. - This record has since been broken by Oklahoma's Sam Bradford in the 2007 season. 1 2 Cirminiello, Richard (December 12, 2006). "2006 CFN Freshman All-America First Team". Scout.com. College Football News. Retrieved December 13, 2006. 1 2 "Most Disappointing College Players - Colt McCoy, QB - Soph., Texas". SI.com. Time Warner. October 7, 2007. Retrieved October 11, 2007. ↑ King, Jason (October 16, 2008). "The real McCoy". Rivals.yahoo.com. Yahoo! Sports. Retrieved December 14, 2008. ↑ "Final BCS Standings 2008". CNNSI.com. January 15, 2009. Retrieved January 26, 2009. 1 2 3 "Rice 10 - (7) Texas (52) - McCoy breaks career TD pass mark in Longhorns' triumph over Owls". ESPN.com. The Walt Disney Company. September 20, 2008. Retrieved September 28, 2008. 1 2 3 4 "(3) Texas 35; Kansas 7 - Recap - Texas QB McCoy burns Kansas for two record-breaking TDs". ESPN.com. Disney Company. November 15, 2008. Retrieved November 15, 2008. 1 2 3 4 5 "(11) Missouri 31, (1) Texas 56 - McCoy, No. 1 Texas ride 35-0 lead past No. 11 Mizzou - Recap". ESPN.com. The Walt Disney Company. October 18, 2008. Retrieved October 18, 2008. 1 2 3 4 5 6 7 "Texas A&M 9 - (4) Texas 49". SI.com. Time Inc. November 27, 2008. Retrieved November 28, 2008. ↑ "Texas Longhorn Football Statistics 2008". UTexas Athletics. Retrieved January 26, 2009. ↑ Vertuno, Jim (December 3, 2008). "UT sweeps AP's Big 12 awards w/ McCoy, Orakpo". Houston Chronicle. Hearst Corporation. Archived from the original on December 5, 2008. Retrieved December 14, 2008. 1 2 3 4 Schroeder, George (October 5, 2006). "McCoy still big news in small town" (PDF). Oklahoman. Retrieved January 4, 2007. 1 2 3 Chris Dortch, ed. (2005). Blue Ribbon College Football Yearbook 2005. Ambrose Printing Company. p. 121. ISBN 0-9768618-0-1. 1 2 3 4 5 6 "Colt McCoy #12". MackBrownTexasFootball.com. Retrieved January 5, 2007. 1 2 Trubow, Allen; Suzanne Halliburton (September 4, 2007). "Longhorns notebook". Austin American-Statesman. Cox Enterprises. Retrieved September 4, 2007. ↑ Brown, Chip (December 24, 2006). "UT's Colt strong out of the gate". Dallas Morning News. Belo Company. Archived from the original on October 25, 2008. Retrieved December 14, 2008. ↑ Vertuno, Jim (December 5, 2006). "McCoy or McCoy? Texas In QB Quandary" (PDF). Laredo Morning-Times. Associated Press. ↑ Corcoran, Michael (November 14, 2005). "Ruining a Longhorns game on TV as easy as ABC". Austin American-Statesman. Cox Enterprises. Retrieved February 28, 2006. ↑ "Texas tabs McCoy to start at quarterback". ESPN.com. Disney Company. August 29, 2006. Retrieved December 31, 2006. ↑ "Texas tops Oklahoma 28-10". Austin American-Statesman. Cox Enterprises. October 7, 2006. Archived from the original on November 9, 2006. Retrieved October 7, 2006. ↑ "Texas 28, Oklahoma 10". Austin American-Statesman. Cox Enterprises. October 10, 2006. Retrieved October 7, 2006. ↑ Vertuno, Jim (October 14, 2006). "No. 6 Texas 63, Baylor 31". MackBrown-Texasfootball.com. Associated Press. Retrieved October 16, 2006. ↑ Wilkerson, William; Killian, Ryan (October 16, 2006). "Unholster the Colt, Longhorns beat early deficit to take 63-31 win over Baylor". The Daily Texan. Texas Student Publications. Retrieved October 16, 2006. ↑ Wilkerson, William (October 30, 2006). "McCoy earns, shuns attention after dramatic wins". The Daily Texan. Texas Student Publications. Retrieved October 31, 2006. ↑ "X-rays negative on Texas QB McCoy; status uncertain". ESPN.com. Disney Company. November 14, 2006. Retrieved November 15, 2006. ↑ "UT QB McCoy has time to heal - Week off before A&M game will help UT freshman recover". Dallas Morning News. Belo Company. November 13, 2006. Archived from the original on September 27, 2007. Retrieved November 15, 2006. ↑ "McCoy says he's fine". Austin American-Statesman. Cox Enterprises. November 12, 2006. Retrieved November 15, 2006. ↑ "Texas vs Kansas State (Nov 11, 2006) - Play-by-Play Summary". MackBrown-TexasFootball.com. November 11, 2006. Retrieved November 15, 2006. ↑ Wilkerson, William (November 14, 2006). "Bye comes at the right time - Big 12 title still up for grabs despite Texas' loss to Kansas State; McCoy says he's 'fine'". Austin American-Statesman. Cox Enterprises. Retrieved November 15, 2006. ↑ McDonald, Jeff (November 12, 2006). "Football: McCoy's stinger gets time to heal". San Antonio Express-News. Archived from the original on September 29, 2007. Retrieved November 15, 2006. ↑ Duarte, Joseph (November 13, 2006). "McCoy hopes to face Texas A&M - Texas QB gets extra week to heal from pinched nerve". Houston Chronicle. Hearst Corporation. Retrieved November 15, 2006. ↑ Killian, Ryan (November 21, 2006). "McCoy set to play against Aggies". The Daily Texan. Texas Student Publications. Retrieved November 23, 2006. ↑ Robbins, Kevin (November 25, 2006). "Now what for Texas? - Aggies' dominance forces Horns to look for help from Sooners.". Austin American-Statesman. Cox Enterprises. Retrieved November 25, 2006. 1 2 3 4 5 Halliburton, Suzanne (November 25, 2006). "McCoy suffers severe pinched nerve in neck - Longhorns quarterback spends three hours at hospital for testing". Austin American-Statesman. Cox Enterprises. Retrieved November 26, 2006. ↑ "McCoy lacks McGee's toughness". The Battalion. November 27, 2006. Retrieved November 27, 2006. ↑ "2006 Football - Rules and Interpretations" (PDF). NCAA Official website. Archived from the original (PDF) on November 19, 2006. Retrieved November 26, 2006. 1 2 "Texas A&M runs down Texas to snap 6-game series skid". ESPN.com. Associated Press. November 24, 2006. Retrieved November 25, 2006. ↑ Halliburton, Suzanne (November 25, 2006). "The gig is up - A&M shoots down Texas streaks with 12-7 win at Royal-Memorial". Austin American-Statesman. Cox Enterprises. Retrieved November 26, 2006. ↑ Ransom, Eric (November 25, 2006). "QB's day unravels in the second half". Fort Worth Star-Telegram. Retrieved November 26, 2006. 1 2 3 "Texas' McCoy suffers pinched nerve, return unknown". ESPN.com. November 24, 2006. Retrieved November 25, 2006. ↑ "Longhorns football - Texas A&M 12, Texas 7". Austin American-Statesman. Cox Enterprises. November 25, 2006. Retrieved November 25, 2006. ↑ Justice, Richard (November 24, 2006). "Turn out the lights, Longhorn fans, the party's over". Houston Chronicle. Retrieved November 25, 2006. ↑ "Texas A&M vs Texas (Nov 24, 2006)". MackBrownTexasFootball.com. Retrieved November 25, 2006. ↑ "Texas players elect to transfer". MackBrown-TexasFootball.com. December 1, 2006. Retrieved December 1, 2006. ↑ "Colt McCoy cleared to play in Alamo Bowl". yahoo.com. Associated Press. December 21, 2006. Archived from the original on January 7, 2007. Retrieved December 30, 2006. ↑ "OU QB Bradford sets NCAA freshman scoring record". ESPN.com. The Walt Disney Company. November 24, 2007. Retrieved October 18, 2008. ↑ Rivals.com's QB Power Rankings, CNNSI.com, April 2, 2007. ↑ 2007 Preview – Big12 edition. Athlon Sports. 2007. p. 101. ↑ "Harrell Named to Preseason Maxwell List". CSTV.com. Retrieved June 26, 2007. 1 2 College Football – 2007 Season Preview. CBS Sportsline.com. 2007. p. 33. ↑ "Harrell Named to Manning Award Watch List". CSTV.com. Retrieved August 8, 2007. ↑ "Harrell Named to O'Brien Watch List". CSTV.com. Retrieved August 22, 2007. ↑ Russo, Ralph (August 19, 2007). "USC Is No. 1 in AP Top 25 College Poll". Austin American-Statesman. Associated Press. Archived from the original on August 22, 2007. Retrieved August 19, 2007. ↑ "Longhorns ranked fourth in coaches poll". Austin American-Statesman. Cox Enterprises. August 3, 2007. Retrieved August 3, 2007. ↑ Vertuno, Jim (September 1, 2007). "McCoy tosses 2 TDS but Texas shaky in 21-13 win". Austin American-Statesman. Cox Enterprises. Retrieved September 1, 2007. ↑ "McCoy, Texas regain composure to handle TCU". ESPN.com. The Walt Disney Company. September 8, 2007. Retrieved September 8, 2007. 1 2 3 Halliburton, Suzanne (September 16, 2007). "One tough Knight - Central Florida opens new stadium by pushing Texas to brink.". Austin American-Statesman. Cox Enterprises. Retrieved September 16, 2007. 1 2 "Rice 14, (7) Texas 58 - Recap". ESPN.com. The Walt Disney Company. September 22, 2007. Retrieved September 24, 2007. 1 2 Bohls, Kirk (September 23, 2007). "Horns need Chiles in the game more often - Backup would benefit from increase in action". Austin American-Statesman. Cox Enterprises. Retrieved September 24, 2007. ↑ Hale, Cody (September 24, 2007). "Longhorns fry Rice, 58-14 - McCoy-Sweed link easily powers Texas past old SWC rival". The Daily Texan. Texas Student Publications. Retrieved September 24, 2007. ↑ Treon, Ricky (September 24, 2007). "Chiles turns heads without even making a completed pass". The Daily Texan. Texas Student Publications. Retrieved September 24, 2007. ↑ Killian, Ryan (September 24, 2007). "Chiles' youth only reason to keep him off the playing field". The Daily Texan. Texas Student Publications. Retrieved September 24, 2007. ↑ "Kansas State 41, (7) Texas 21 - Complete Play-by-Play". ESPN.com. The Walt Disney Company. September 29, 2007. Retrieved September 29, 2007. 1 2 Hale, Cody (October 2, 2007). "McCoy, Texas taking hard hits". The Daily Texan. Texas Student Publications. Archived from the original on October 6, 2007. Retrieved October 6, 2007. ↑ Mandel, Stewart (October 4, 2007). "'Horns unhooked - Texas is missing Vince Young-type leadership". SI.com. Time Warner. Retrieved October 11, 2007. ↑ "Sunflower Showdown Next for No. 24 Cats". Scout.com. College Football News. October 1, 2007. Archived from the original on July 16, 2011. Retrieved October 6, 2007. 1 2 3 "Bradford's steady play steers Sooners past Horns". ESPN.com. The Walt Disney Company. October 6, 2007. Retrieved October 6, 2007. ↑ Trotter, Jake (October 7, 2007). "OU back in national title picture". NewsOK.com. The Oklahoman. Retrieved October 7, 2007. ↑ "Comings and goings at end". Austin American-Statesman. Cox Enterprises. October 7, 2007. Retrieved October 7, 2007. ↑ "Colt doesn't hold a grudge over late hit". Austin American-Statesman. Cox Enterprises. October 8, 2007. Retrieved November 7, 2007. ↑ "(10) Oklahoma 28, (19) Texas 21". ESPN.com. The Walt Disney Company. October 6, 2007. Retrieved October 6, 2007. 1 2 "Texas ends Big 12 skid, sends Iowa St. to worst loss since '97". ESPN.com. The Walt Disney Company. October 13, 2007. Retrieved October 14, 2007. 1 2 Trubow, Alan (October 15, 2007). "After refreshing win, soft part of UT schedule continues - Coming up next: Baylor, then Nebraska". Austin American-Statesman. Cox Enterprises. Retrieved October 16, 2007. 1 2 "Notebook: Takeaway time; Colt riding high". Austin American-Statesman. Cox Enterprises. October 14, 2007. Retrieved October 16, 2007. 1 2 Halliburton, Suzanne (October 14, 2007). "Texas plays part of bossy houseguest - Iowa State, coached by ex-UT assistant, suffers through 56-3 blowout at hands of Horns". Austin American-Statesman. Cox Enterprises. Retrieved October 16, 2007. 1 2 "(23) Texas 56, Iowa State 3". ESPN.com. The Walt Disney Company. October 13, 2007. Retrieved October 14, 2007. ↑ "Mack has high praise for Colt". Austin American-Statesman. Cox Enterprises. October 15, 2007. Retrieved October 16, 2007. ↑ Center, Bill (December 28, 2007). "McCoy and Orakpo take MVP trophies". SignOnSanDiego.com. Copley Press. Retrieved December 29, 2007. ↑ "Charles leaving school to enter NFL draft". ESPN.com. The Walt Disney Company. January 2, 2008. Retrieved January 3, 2008. 1 2 "#12 Colt McCoy - QB". ESPN.com. The Walt Disney Company. Retrieved October 4, 2008. ↑ "(5) Texas 38 - Colorado 14". ESPN.com. The Walt Disney Company. October 4, 2008. Retrieved October 4, 2008. ↑ "(5) Texas 45 - (1) Oklahoma 35 - Texas builds on second-half momentum to drop Oklahoma". ESPN.com. The Walt Disney Company. October 11, 2008. Retrieved October 11, 2008. ↑ "Third and Longhorns - John Bridges' sometimes-warped view from the press box.". Austin American-Statesman. Cox Enterprises. November 1, 2008. Retrieved November 11, 2008. ↑ "(3) Texas 35; Kansas 7 - Box Score". ESPN.com. Disney Company. November 15, 2008. Retrieved November 15, 2008. ↑ "Longhorns squash Buckeyes' upset dreams with 26-yard score at :16". Scores.espn.go.com. January 1, 2008. Retrieved March 21, 2009. ↑ "Texas Longhorns kick open door to title game". Archived from the original on December 12, 2009. ↑ "Colt McCoy Player Profile". Sports.espn.go.com. Retrieved December 14, 2008. ↑ Halliburton, Suzanne (September 5, 2009). "McCoy rewriting record book, but for him only wins matter". Austin American-Statesman. Retrieved June 10, 2011. ↑ "McCoy national freshman of the year". Austin-American Statesman. Cox Enterprises. February 10, 2007. Retrieved October 4, 2008. ↑ "McCoy, Orakpo named AP Big 12 Players of the Year". MackBrown-Texasfootball.com. University of Texas. December 3, 2008. Retrieved December 3, 2008. ↑ Big12Sports.com (December 2, 2008). "2008 All-Big 12 Football Awards Announced". Big12sports.com. ↑ "2008 Walter Camp Player of the Year". Waltercamp.org. Walter Camp Foundation. December 11, 2008. Retrieved December 11, 2008. ↑ "2008 Walter Camp All America team". Waltercamp.org. Walter Camp Foundation. December 11, 2008. Archived from the original on December 14, 2008. Retrieved December 11, 2008. ↑ "2008 FWAA All-America team". Sportswriters.net. Football Writers Association of America. December 13, 2008. Retrieved December 13, 2008. ↑ "SI.com's 2008 All-Americans". CNN. December 16, 2008. Retrieved April 30, 2010. ↑ "McCoy wins MVP award named for Archie Griffin". ↑ "Texas Tech QB Harrell named co-national player of the year". ↑ "2008 Heisman Memorial Trophy". Heisman.com. December 13, 2008. ↑ "2009 FWAA All-America Team". Sportswriters.net. 2009-12-12. Retrieved 2012-07-14. ↑ "Official Site of the Southeastern Conference". Secsports.com. Retrieved 2012-07-14. 1 2 "2009 All-Big 12 Football Awards Announced - Big 12 Conference - Official Athletic Site". Big12sports.com. Retrieved 2012-07-14. 1 2 "touchdownclubofcolumbus.com". touchdownclubofcolumbus.com. Retrieved 2012-07-14. ↑ "Johnny Unitas - Golden Arm Award". Goldenarmfoundation.com. 2011-12-24. Retrieved 2012-07-14. ↑ Mandel, Stewart (November 9, 2006). "McCoy for Heisman? - Texas freshman helping 'Horns get over Vince Young". SI.com. Time Warner. Retrieved November 11, 2008. ↑ Halliburton, Suzanne (October 20, 2008). "Tebow would vote for McCoy for Heisman". Austin American-Statesman. Cox Enterprises. Retrieved November 11, 2008. 1 2 "For now, McCoy has Tebow's Heisman vote". USA today. Gannett Company. October 21, 2008. pp. 7C. 1 2 "Baylor 21, (4) Texas 45 -QB McCoy in charge as Texas bashes Baylor". ESPN.com. The Walt Disney Company. November 8, 2008. Retrieved November 11, 2008. ↑ Gilmore, Rodney (November 11, 2008). "Heisman Watch". ESPN.com. The Walt Disney Company. Retrieved November 11, 2008. ↑ "Harrell keeps lead in Heisman poll". Austin American-Statesman. Cox Enterprises. November 11, 2008. Retrieved November 14, 2008. ↑ "Bradford edges McCoy for Heisman lead". Austin American-Statesman. Cox Enterprises. November 24, 2008. Retrieved November 26, 2008. ↑ "Longhorns football notes: More national accolades for Colt McCoy - Accolades piling up for McCoy". Austin American-Statesman. Cox Enterprises. November 25, 2008. Retrieved November 26, 2008. 1 2 3 "McCoy inches closer to winning Heisman". SI.com. Time Inc. November 27, 2008. Retrieved November 28, 2008. ↑ "McCoy moves to top of final Heisman poll". Austin American-Statesman. Cox Enterprises. December 8, 2008. Retrieved December 8, 2008. 1 2 "Oklahoma QB Bradford wins Heisman Trophy". Houston Chronicle. ↑ "2009 Heisman Trophy Voting". ↑ "Texas QB McCoy says he will return for senior season". ESPN.com. The Walt Disney Company. October 23, 2008. Retrieved November 28, 2008. 1 2 "McCoy to seek input on NFL draft status before final decision". ESPN.com. The Walt Disney Company. November 28, 2008. Retrieved November 28, 2008. ↑ Halliburton, Suzanne (December 8, 2008). "McCoy to stay for senior season". Austin American-Statesman. Cox Enterprises. Retrieved December 8, 2008. ↑ Smith, Michael David (April 22, 2010). "Colt McCoy: "I have no expectations"". NFLDraftScout.com. NBC Sports. ↑ "Combine Player Profiles - Colt McCoy". NFL.com. Retrieved 28 October 2014. ↑ "Colt McCoy - Texas, QB : 2010 NFL Draft Scout Player Profile". nfldraftscout.com. The Sports Xchange. Retrieved 28 October 2014. ↑ "Colt McCoy - QB - Texas - 2010 NFL Combine Results". NFL Combine Results. Retrieved 28 October 2014. 1 2 Withers, Tom (April 23, 2010). "Browns rescue Colt McCoy, take Texas QB in draft". Google News. Associated Press. ↑ Reynolds, Jeff (24 April 2010). "Notebook: Will undersized McCoy prove Browns made right choice?". NFLDraftScout.com. CBSSports.com. Archived from the original on 18 June 2013. Retrieved 1 November 2014. ↑ "Browns sign third-round QB McCoy". espn.com. ESPN. April 23, 2010. ↑ "Holmgren happy yet cautious on McCoy; Browns tried for No. 1 pick". NFL.com. Associated Press. April 24, 2010. ↑ "Colt McCoy lone healthy Browns QB". ESPN.com. October 14, 2010. Retrieved 2010-10-11. 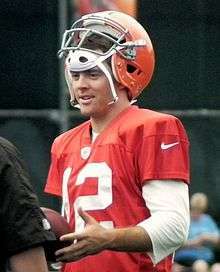 ↑ "Cleveland Browns quarterback Colt McCoy expected to start in New Orleans: Browns Insider". cleveland.com. The Plain Dealer. October 20, 2010. ↑ Hanzus, Dan (2012-08-06). "Brandon Weeden named Cleveland Browns starter". NFL. Retrieved 2012-12-22. ↑ Rosenthal, Gregg (April 1, 2013). "Colt McCoy reportedly traded to San Francisco 49ers". National Football League. Retrieved April 1, 2013. ↑ Hanzus, Dan (April 3, 2014). "Colt McCoy signs contract with Washington Redskins". NFL.com. Retrieved 2014-04-03. ↑ "Watch Tennessee Titans vs. Washington Redskins [10/19/2014] - NFL.com". NFL.com. October 19, 2014. Retrieved 2014-10-19. ↑ Clarke, Liz (October 20, 2014). "Colt McCoy named starter against Dallas; Gruden won't rule out Griffin return". The Washington Post. Retrieved October 27, 2014. ↑ Keim, John (October 27, 2014). "Colt McCoy to start vs. Cowboys". ESPN. Retrieved October 27, 2014. ↑ Crabtree, Curtis (October 27, 2014). "Colt McCoy leads Washington to 20-17 overtime win over Cowboys". Pro Football Talk. NBC Sports. Retrieved October 28, 2014. ↑ "RG3 benched: Redskins to start Colt McCoy vs. Indy". sports.yahoo.com. November 26, 2014. Retrieved November 26, 2014. ↑ Alper, Josh (December 16, 2014). "Colt McCoy heads to injured reserve". NBCSports.com. Retrieved 2014-12-23. ↑ Clarke, Liz (March 17, 2015). "Redskins re-sign quarterback Colt McCoy". The Washington Post. Retrieved April 8, 2015. 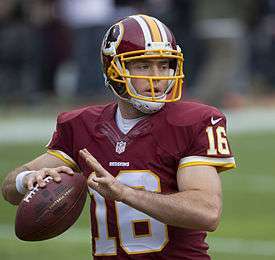 ↑ "Colt McCoy: Washington Redskins agree with QB on 3-year deal". UPI.com. March 9, 2016. Retrieved March 10, 2016. ↑ "Colt McCoy". pro-football-reference.com. Sports Reference LLC. Retrieved September 10, 2016. ↑ "UT QB McCoy helps seizure victim". Dallas Morning News. June 6, 2008. Archived from the original on September 23, 2008. Retrieved October 4, 2008. ↑ "McCoy Is No. 2 in Heisman Vote" (http://www.christianchronicle.org/article2158642~McCoy_is_No._2_in_Heisman_vote retrieved 31 December 2008), Christian Chronicle: An International Newspaper for Churches of Christ, January 2009 (Vol. 66 No. 1), p. 1. ↑ "Chance McCoy - Bio". acusports.com. Abilene Christian University. September 26, 2007. Retrieved October 4, 2008. ↑ "A Closer Look: Case McCoy". Rivals.com. July 21, 2007. Retrieved October 4, 2008. ↑ Cantu, Rick (February 9, 2009). "Texas bags another McCoy". Statesman.com. Retrieved 2009-03-21. ↑ Stuebbe, Kevin Quinn (August 25, 2002). "The Real McCoys". The New York Times. Retrieved February 28, 2006. ↑ Rachel Glandorf. "Rachel Glandorf Profile - Baylor Bears Official Athletic Site". BaylorBears.com. Retrieved 2012-07-14. Wikimedia Commons has media related to Colt McCoy.